LONG BEACH, Calif.--(BUSINESS WIRE)--Pioneer Electronics (USA) Inc. today expands its popular NEX platform with five new NEX in-dash multimedia receivers for 2017. The double-DIN 7” LCD AVH-2330NEX and AVH-2300NEX and double-DIN 6.2”LCD AVH-1330NEX and AVH-1300NEX models are designed to complement the smartphone lifestyle of today’s consumer with continuous connectivity and access to a variety of entertainment options. The AVH-3300NEX expands the NEX line-up into the smaller, more universal single-DIN in-dash receiver size, providing for the first time, a smartphone connectivity solution that easily fits into many older and collectible cars coveted by automotive enthusiasts. The units feature a redesigned, simple-to-use interface and compatibility with popular automotive specific smartphone interfaces and apps such as Apple CarPlay®, Android Auto™1 and Waze®, plus entertainment options such as Bluetooth® music streaming and hands-free calling, Spotify® and Pandora®. For 2017, the new NEX models have been engineered with an optimized PCB layout for audio signal integrity and a number of audiophile-grade components to deliver a premium audio listening experience. Bluetooth Wireless Connectivity – All models feature built-in Bluetooth2 wireless connectivity for convenient hands-free calling and music streaming with compatible Bluetooth enabled devices. Users are able to pre-register up to five smartphones with the receivers, enabling hands-free calling and/or music to be streamed from any of the five previously paired phones, eliminating the need to pair and unpair devices. Additionally, the response time between switching pre-registered devices is faster, as is access to music and contacts stored on the connected device. To maximize the connectivity options and call quality for hands-free communication and wireless audio streaming, each NEX receiver features Bluetooth AVRCP 1.6 to provide browsing capability of a user’s media library, and HFP 1.6 with wideband speech for clearer overall sound quality, making it easier to recognize and understand voices during calls. Three of the five models feature Android Auto integration, allowing consumers to quickly connect their compatible smartphones to extend the Android platform into the car in a way that is purpose-built for driving. Designed with safety in mind, Android Auto utilizes a simple and intuitive interface to provide navigation, communication, music and more, combined with powerful new voice actions for minimized distraction, so users stay focused on the road. Smartphones running Android 5.0 (Lollipop) or newer operating systems offer Android Auto and will work with the three Pioneer models. Pioneer’s CarPlay-compatible NEX in-dash receivers offer consumers the ability to upgrade the vehicles they already own with the latest iPhone® technology specifically designed for the car. Consumers with the latest version of iOS on their iPhone 5 or newer, including iPhone 7, iPhone 7 Plus, iPhone 6s Plus and iPhone 6s, can use Siri® voice control to make and receive calls, compose and respond to text messages, access Apple Maps for navigation, and listen to their music, podcasts, or iTunes® Radio. Spotify – Control content from the Spotify app for iPhone and Android devices as a dedicated source on the receivers. Listeners can now play, pause and skip tracks using the Pioneer controls, and with a few taps, it is just as easy to browse playlists, albums and radio stations on the go. Premium3 users enjoy ad-free, high quality music and can download music and listen offline with no internet connection. Pandora Station Creation and Station Presets – The Pandora station creation4 feature enables users to create new Pandora stations while the app is in use with an iPhone device or compatible Android smartphone. Users can simply press and hold a button on the new receivers to create a new Pandora station dynamically from the currently playing song or artist. Pandora enables listeners to store their personalized stations on six presets for easy access on the receiver. SiriusXM Radio Connectivity – The 2017 NEX models are SiriusXM® compatible with the addition of a SXV300 SiriusXM Vehicle Connect Tuner (sold separately, SiriusXM subscription required). The receivers are also compatible with the Tune Start™, Tune Scan™, Tune Mix and Sports Flash features of SiriusXM. HD Radio® Technology – For high quality audio broadcasts, the AVH-2330NEX and AVH-1330NEX feature a built-in HD Radio tuner, providing clear digital reception of HD Radio and additional multi-casting programming on HD1, HD2 and HD3 broadcasts from participating radio stations across the country. Sleek Visual User Interface – Each display in the NEX receiver lineup is built with a clear resistive touchscreen and 24-bit true color LCD panel, making it more responsive than traditional resistive touchscreens, with increased color depth for brighter colors and more vibrant images. The five models also feature a redesigned UI with large source and system settings icons for easy accessibility and operation. For more information on the new line, visit http://www.pioneerelectronics.com/PUSA/Car/NEX. Pioneer’s NEX receivers will be available in July with suggested retail prices of: $600 (AVH-3300NEX), $500 (AVH-2330NEX and AVH-2300NEX), and $400 (AVH-1330NEX and AVH-1300NEX). 1Android Auto compatible with AVH-3300NEX, AVH-2330NEX and AVH-2300NEX only. 2Bluetooth functionality requires a compatible Bluetooth-enabled mobile phone. Certain Bluetooth features may not be supported by all compatible Bluetooth-enabled devices, and/or the functionality of such features may be limited in certain devices or by certain wireless carriers. 3Spotify Premium requires a monthly paid subscription. 4Feature requires compatible receiver and metadata must be available on desired track or artist from which user wants to create station. 5CarPlay is accessible via the user’s iPhone cable or Pioneer’s optional CD-IU52 cable, and Android Auto is accessible via the user’s compatible Android device cable or Pioneer’s optional CD-MU200 cable. USB Type-C devices may require additional Google certified adapters or cables. 6An active data connection is required to use the Waze application. Functionality is limited when driving to reduce driver distraction. The parking brake must be engaged to access the keyboard and enter location destinations. 8To use Auto EQ or Auto Time Alignment, Pioneer’s CD-MC20 microphone is required. The CD-MC20 is sold separately from the receiver. 9For the full list of compatible format types, visit the product page- http://www.pioneerelectronics.com/PUSA/Car/NEX. Video playback is enabled only when the vehicle is in park and the parking brake engaged. The receiver will down-res the video to the resolution format of the receiver (800x480 for AVH-1300NEX/AVH-1330NEX and 840x480 for AVH-2300NEX/AVH-23300NEX/AVH-3300NEX). Apple, CarPlay, iPhone, Siri, and iTunes are registered trademarks of Apple Inc., registered in the U.S. and other countries. HD Radio and Artist Experience are proprietary trademarks of iBiquity Digital Corporation. 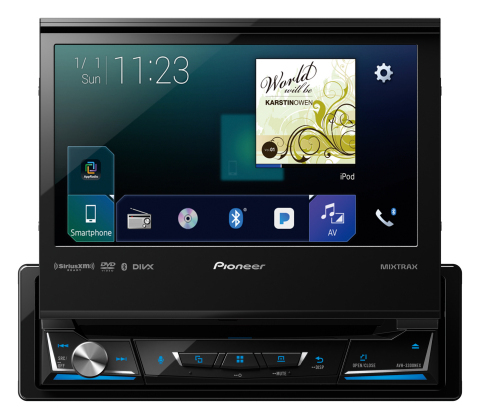 Pioneer today expands its popular NEX platform with five new NEX in-dash multimedia receivers for 2017. The AVH-3300NEX is the first single-DIN unit with Apple CarPlay and Android Auto.